Aerochambers are designed to assist people using metered dose inhalers (also known as puffers or MDIs) to use their medication properly. The medication in an MDI is intended to be sprayed into an open mouth and then deeply inhaled into the lungs as a mist. Many people, children especially, tend to close their lips around the outlet of the MDI and then spray it. What happens when used this way is the medication, instead of being in mist form, is in liquid form and coats the inside of the mouth and then is swallowed. Therefore the lung medication ends up in the stomach instead of the lungs where it will be effective. 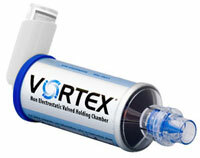 With an aerochamber the MDI is sprayed into an open chamber at one end and the user inhales the mist from the other. aerochambers are available in different sizes and styles depending on the age, size and needs of the user. Peak flow meters are diagnostic tools that users can use to monitor and track their asthma condition. It will not only indicate to the user how well their lungs are functioning but also they can create a written record of their results that their physician can use in determining their condition and treatment efficiency. To use a peak flow meter, the user has to sit up straight or stand, inhale deeply and with the peak flow meter placed firmly in their mouth exhale as hard and fast as possible. This is repeated 2 more times with the highest reading being recorded. Using peak flow meters helps the user to know what triggers an asthma attack, determine if their treatment is effective, when to make a change in medications or dosage or seek emergency medical attention. 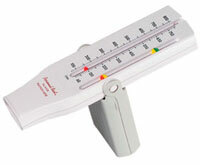 Peak flow meters can indicate to the user that an asthma attack may imminent in the next hours or even days. Fingertip pulse oximeters are also diagnostic devices that indirectly monitors the oxygen saturation of a patient's blood (as opposed to measuring oxygen saturation directly through a blood sample) and changes in blood volume in the skin. Most portable oximeters also measure the heart rate to give doctors and the user an idea of the amount of oxygen present in the blood. The readings indicated on a pulse oximeter do not give a complete measure of respiratory sufficiency but is a non-invasive quick method of determining the amount of oxygen in the blood. 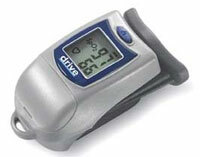 Portable pulse oximeters were very expensive a number of years ago and not very practicable for home use because of the expense but today portable oximeters can be purchased for not much more than $100.00. High pressure oxygen tanks hold approximately 2,000 psi of medical grade oxygen and aren't as common today as they used to be but there are still some around as they do offer a couple of advantages over the more common low pressure liquid oxygen tanks. These oxygen cylinders come in a couple of sizes but although they hold a lot of pressure, they do not hold a lot of oxygen volume and don't last very long before they need to be refilled. Oxygen conserver regulators for high pressure cylinders are more efficient the normal regulators and will extend substantially the length of time the tank will last. A normal oxygen regulator will provide a constant flow of oxygen to the mask or cannula but the oxygen flowing while the user is exhaling goes into space and is wasted. The oxygen conserver regulator senses the breath of the user and only allows oxygen flow while the user is inhaling.